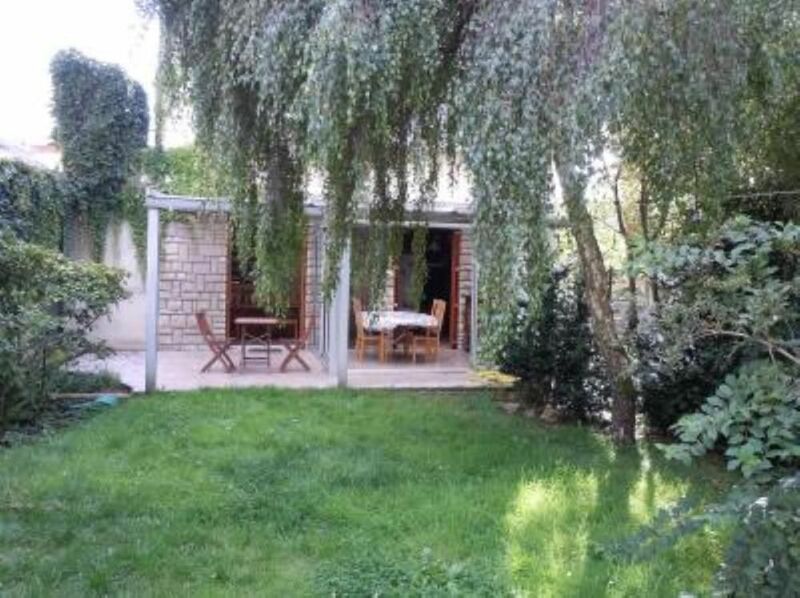 House well-appointed (200 m2), quiet with shaded garden enclosed (150 m2) close to the shops, located at 20 mn of Paris's center by RER A (about one train every 10 mn). Description: 5 bedrooms, 1 living room, 1 office, 1 dining room, 1 separate kitchen, 2 bathrooms, 2 separate toilets, balcony upstairs, veranda. Sleeping arrangements for 15 persons: 1 double bed (180 cm x 200 cm), 3 double sofas (160 cm x 195 cm, 140 cm x 195 cm, 120 cm x 190 cm), 5 single beds (90 x 200 cm, 90 x 200 cm, 90 cm x 200, 80 cm x 190 cm, 80 cm x 190 cm), 2 single sofas (115 cm x 180 cm, 85 cm x 195 cm). We booked this house for a family reunion of 10 people, and we had a comfortable stay, the first week of July. It is located in Fontenay-sous-Bois, a quiet neighborhood east of Paris center. From this house it is 10 minutes walking distance to the train station (or take bus 124) then 20 minutes to the Paris center on RER A. There is a Monoprix grocery store not too far and several bakeries. We used this house as a base to explore Paris and Versailles. The house is conveniently located on the bus line to the Vincennes castle. Great communication with the the owner who speaks English. We appreciated having all the appliances available (dishwasher, clothes washer and clothes dryer). Seven adults and five children fitted very comfortably into this house. It was clean and homely, and well equipped for all our needs. The terrace and garden were a bonus, as it was very warm. Despite this, the house did not become uncomfortable. The location is very good. It is a ten minute walk to the station, and the trains are very frequent, and it takes barely fifteen minutes to get to Chatelet les Halles. There is also a bus stop at the end of the road. For the cheapest travel on all transport in Paris, and around, get a Passé Navigo Decouverte. The supermarket is literally five minutes away and there are local bakeries, restaurants and pharmacies etc. Fontanay is a pleasant quiet suburb. A good base for a Paris holiday. Parigi 6012747 casa molto accogliente, pulita e ordinata, situata in una zona tranquilla e vicinissima al centro di Parigi. Consigliata per famiglie con bambini che possono utilizzare i giochi messi a disposizione. il proprietario e' molto gentile e preciso. "Excelente casa en París, muy bien comunicada y muy acogedora. El entorno es muy tranquilo y el dueño es muy atento. Tiene muchas ventajas, grandes habitaciones, un porche con jardín excelente, muy bien equipada (tener ordenadores con conexión a internet es fundamental para organizar tus visitas). Los baños son un poco antiguos pero a pesar de ello los 14 que ibamos quedamos encantados con la casa y con su casero. No dudeis en alquilarla porque ofrece muchas ventajas." Bons acessos ao centro de Paris ( RER ). By RER A (direction 'Boissy-Saint-Léger' or 'La Varenne Chennevières'): exit the station 'Fontenay-sous-Bois' tail, on the right after the turnstiles, street which goes up, go on the left after the red light and 1st street on the right. By car: take the A86 motorway, exit at 'Le Perreux' (from the south) or exit at 'Fontenay centre' (from the north). Tarif dégressif / Decreasing rental cost / Descuento : - 1150 euros pour 1 semaine ; - 2150 euros pour 2 semaines ; - 3050 euros pour 3 semaines ; - 4100 euros pour 1 mois. Ménage / Housework / Servicio de limpieza : il est possible de payer 50 euros pour ne pas avoir à faire le ménage avant de partir, à condition de quitter ma maison avant 10h le jour du départ.